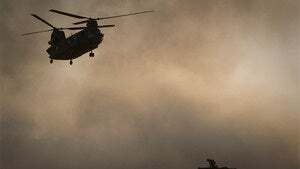 The Wall Street Journal reports that a Chinook helicopter carrying 31 US special forces troops and 7 Afghan troops was shot down last night by a Taliban insurgent's missile. The crash killed everyone onboard. Afghan president Hamid Karzai confirmed the crash, sending his condolences to American forces. The chopper was fired upon during a night raid over a village in Afghanistan's Wardak province. Up until now, the deadliest crash took place back in 2005, when, similarly, a rocket took down a Chinook aircraft carrying 16 troops on a rescue mission. Among those killed were 25 Navy SEALS, a major loss to the group that took down bin Laden. You can watch the report on ABC News.